Let us help you care for the environment! Blue recycling garbage bags are mandated in some towns, and ours meet all the requirements of those programs. Even if blue trash bags are not mandatory, they really are good looking. They also make it easier to sort and see what you’re disposing of. Available in several sizes and thicknesses, we have the right bag for your recycling needs. Wholesale recycling bags are great for the earth and they’re also good news for your budget. When you buy bulk recycling bags, you pay significantly less per bag, and ordering a large quantity also help to reduce the carbon footprint required by multiple shipments or trips to the store for restocking. Here at Plastic Place we want to make it as easy as possible to find the blue recycle bags you need at exceptional prices. 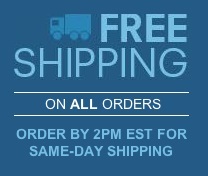 What’s more, we’re devoted to delivering them with the best customer service around. If you need help choosing the right bag, just get in touch. Our experts would be happy to walk you through purchasing the ideal bags for your home or business. 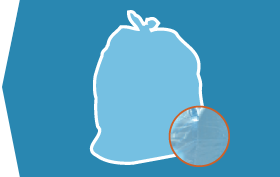 Blue recycling garbage bags are available in many sizes and thicknesses. We have small recycling bags which hold just 12 to 16 gallons: these are great for little recycling cans in the home office. We also have extra-large recycling bags which can cope with recycling on a large commercial scale. Thickness matters when you’re choosing a recycling bag. High-density recycling bags are great for paper and plastic recycling. If you are recycling sharp or heavy items like metal can lids and glass, you should choose low-density bags. The thickness of high density bags is measured in microns, while low-density recycling bags are measured in mils. The bigger the number of either mils or microns, the thicker the recycling bag. These are recyclable trash bags.